This ain't no Starbucks! 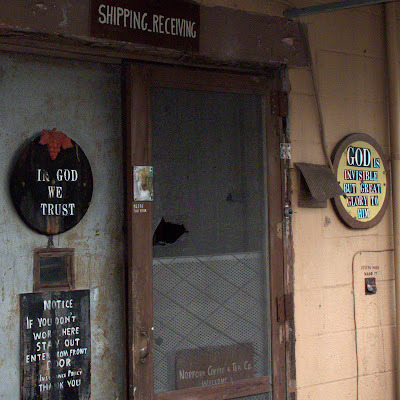 The shipping and receiving door at the Norfolk Coffee & Tea Company at 212 E 18th Street in Norfolk Virginia, a local landmark. The family has been roasting and blending coffee in Norfolk Virginia since 1918 and at this location since 1938. No venti soy double latte' served here, no website either, just great freshly roasted coffee for your coffee maker. See if you can find the "Bless This Door" sign. Canon G10, 1/200 at f/3.5, ISO 200, 28mm equivalent focal length.